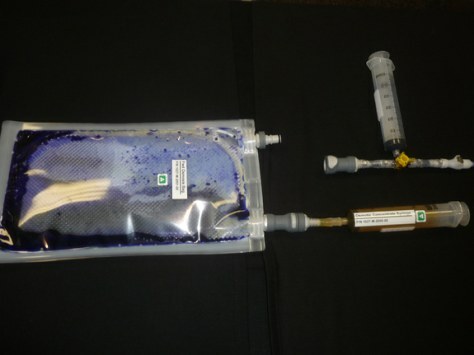 The Forward Osmosis Bag system consists of a bag with two chambers separated by a semi-permeable membrane. A sugary syrup is injected into the inner chamber (syringe at right), while the liquid to be purified is introduced into the outer one. Pure water passes across the membrane into the inner chamber, producing a potable liquid much like a sports drink.